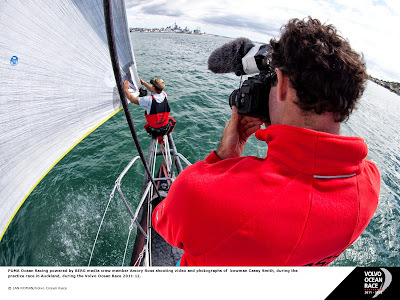 The Volvo Ocean Race launched the search for the third generation of multimedia reporters to sail onboard the boats back on January 11. 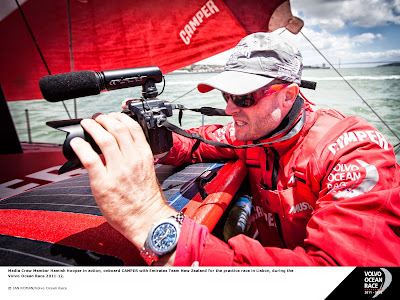 The video advertisement called for experienced multimedia storytellers with steady enough hands and nerves to supply video, audio, text and pictures from the oceans during the nine-month race around the world. Since then, the response from people wishing to work on the world’s premier round-the-world sailing race has been staggering and organisers are working hard to sift through the emails with a view to finding the perfect candidate for each team. Applications have come from around the world, with the Race’s home country of Spain topping the list in terms of numbers of people writing in with resumes since the launch on January 11. Further interest has come from other countries already confirmed on the route for 2014-15, including the United States, Sweden, Brazil, United Arab Emirates, Portugal, New Zealand and China, as well as other nations closely connected with the Volvo Ocean Race such as the Netherlands, Italy, France and the United Kingdom and others that have had less direct direct connection with the event up to now, including Greece, Venezuela, Turkey, Poland and Czech Republic. In terms of professional experience, applicants include those with backgrounds as camera operators, directors, reporters, sports and news journalists. “The Onboard Reporter is a unique feature of this event,” said Volvo Ocean Race CEO Knut Frostad. “They are the war correspondent of the race. It’s something that we started quite recently and it’s really to bring the story, excitement and action to the audience. The 2014-15 Race will be the third in succession to feature Onboard Reporters, formerly known as Media Crew Members. This time, each Onboard Reporter must be approved by the Volvo Ocean Race to make sure the best use is made of the improved media capabilities of the One Design Volvo Ocean 65. There is no official deadline for the process, meaning applications are still being accepted. How is the Onboard Reporter search progressing? We’ve been stunned by the response. We've had around 1,500 applications already and it’s an incredibly diverse set of people sending in their cvs. The levels of skill and experience from many of the candidates are off the charts and the whole process is proving to be a fantastic window on the passion people have for the Volvo Ocean Race and how much they want to be involved. The campaign was launched over two months ago and I know many people will be wondering what has happened to their applications. Can you fill us in on the coming schedule? I want to assure everyone that this is an ongoing process. We're still getting applications and we're delighted to be receiving them. The next step is to continue working through all of the many emails and CVs and to carefully weigh each person's skill sets and experience. A big part of the process is to work with the teams to make sure we get the right match. The worst thing we could do would be to move too quickly and get this wrong as it's absolutely fundamental. So as well as making sure we choose the best candidates out there to work with and carry on in the selection process, we must have an eye on where they will best fit. As more teams become more active, we'll see more progress. You were an Onboard Reporter for PUMA in 2008-09 and you managed the project last time. What would be your advice to candidates? We’ve listened to what the fans had to say and the fans have told us that they love seeing these great images of the power and the raw energy of the Volvo Ocean Race, but what they really want are stories. They want us to take them inside the Volvo Ocean Race and give them a real insight. They want to know what the crew are thinking, feeling, doing. We're looking for people who can bring that vision to life and it's a very special sort of person who can do that from a Volvo Ocean 65. My advice to all these applicants is to show us that you have that experience and skill in telling stories across a variety of media. If I were a potential OBR for this race, I’d be honing my storytelling skills. You don’t have to have a Volvo Ocean 65 and a full crew to tell stories – stories are everywhere all around us. Practise the craft of telling them! Candidates should send a cover letter and resumé to reporters@volvooceanrace.com.